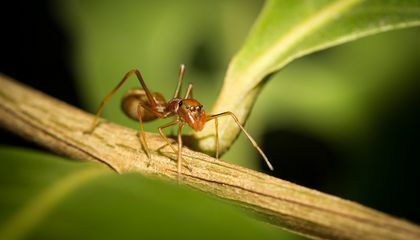 Ants have been farming for upwards of 55 million years. Humans started farming about 12,000 years ago. So, ants got a huge head start when it comes to growing food. They were developing their agricultural techniques for about 49,988,000 years while we were nonexistent and then roaming around scrabbling for food. It is no wonder, then, that we find sophisticated agriculture systems in some ant species. At the pinnacle of farming abilities are the famous leaf-cutter ants. They cultivate fungus gardens as a unique food for their colony. Like us, they prepare "soil" (leaf cuttings), plant, weed and fertilize. And they protect their gardens from pests. Each ant has its own job. Tiny ants tend the gardens and feed the larvae. Larger ants bring leaf cuttings. And they defend the nest from intruders. Their agriculture may seem tiny in scale compared to ours. But a single leaf-cutter ant nest may process as much vegetation as an adult cow. Ants are major ecosystem engineers. They crop leaves and recycle nutrients into the soil. And, to ants, sustainable agriculture comes naturally. Waste from the garden is carried to a compost pile by designated ant workers. The pile is regularly mixed by other ants. This speeds up decomposition. What characteristics have allowed ants to become successful farmers? Find out more on Thursday, December 10, 2015. We will present a Smithsonian Science How live webcast. It is called The Evolution of Agriculture in Ants. (It airs at 11 a.m. and 2 p.m. EST. Watch it on the Q?rius website). Entomologist Dr. Ted Schultz from the National Museum of Natural History will appear live. He will discuss and answer questions. Get teaching resources to support your webcast experience. Why have ants been farming longer than humans? Ants have been farming for a longer time than humans have here are three reasons why!!!! #1 we have started 12,000 years ago and they started 55 million years ago!!! #2 they were developing techniques for 49,988,000 years wile we were roaming around for food!!! #3 the ants can provide as much vegetation as a cow!!! Those are three reasons why ants have been farming longer than humans have!!! I think ants were farming longer than humans is because they are allways moving.I also think that ants have been alive longer than humans.I also think that ants never go to sleep. 1#Ants been farming longer than humans because ants got a head start. 2#Ants were developing their skills for about 49,988,000 years. 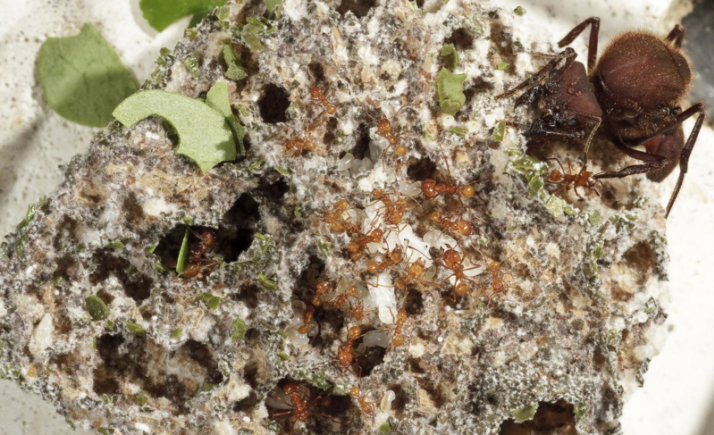 So ants can get a head start when it comes to growing food. They where developing their agricultural teehniquse for about 49988000 years. While we where nonexistent and then the ants reaming around for food. 1.leaf cutter ants nest may process as much vegetaion as an adult cow. 2.humans started farming about 12,000 years ago. 3.each ant has its own specil job. 1.leaf cutter ants nest may process as much vegetation as an adult cow. 2. Leaf cutter ants have farming for upwards of 55 million years. 3. Ants are major ecosystem engineers. 3#Different kinds of ants can do different kinds of things. They live longer. Their 10,000 years old. Their as old as dinosors. 1.Ants have been living longer than humans. 2.Ants have figured out how to farm before humans. 3.Ants have developed architectural techniques.